We spend so much money on our skin care, it is a little ridiculous sometimes! The United States spends billions. With a B. Now I do not know what portion of those numbers includes taking care of the skin below the neck (aka body care products), but I highly suspect it is less than half. From my personal experience, I know I spend a lot more time and money researching and buying products for my face than anything below the neck. It is one area that we tend to let slide, buying whatever body lotion is on sale or skipping application on multiple days. It is a habit I would like to break so that I can start taking care of all of me. And I am pretty sure I am not unique in that aspect. Open any women’s magazine and you will probably find something like 4 facial care ads for every 1 body care ad. I have not actually counted but I am pretty sure about that observation. That little tidbit about the shopping habits of American women is probably why turtlenecks will always be in style, to cover up the lack of care that we give the skin on our bodies. Consider the fact that our hands and décolleté receive the same sun and environmental damage as our face and it’s no wonder they age faster than the rest of us! 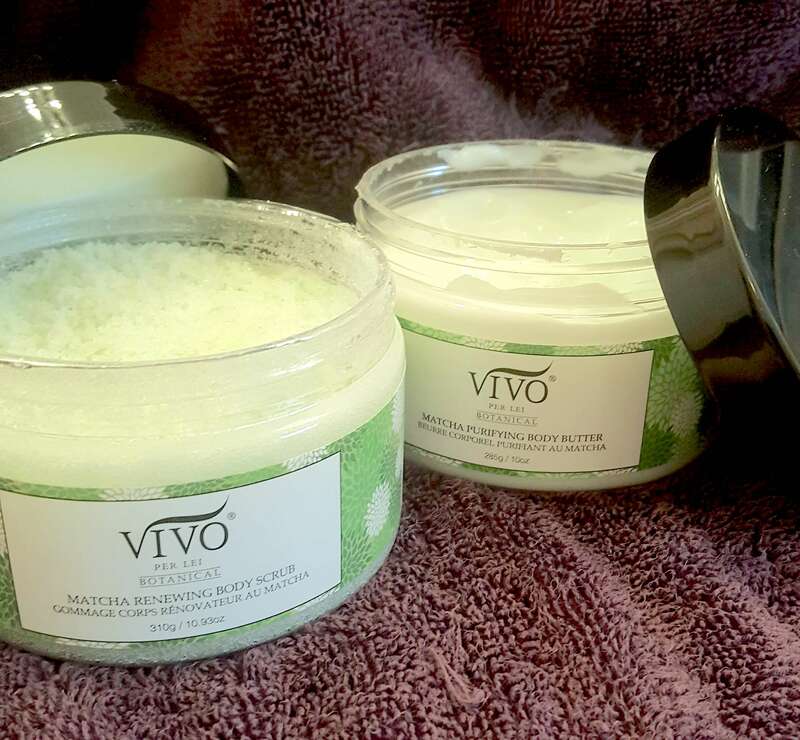 I recently had the opportunity to try two body care treats – the Vivo Per Lei Botanical Matcha Renewing Body Scrub and the corresponding Purifying Body Butter. And my skin was treated well! It reminded me to take the time to treat myself a little better! 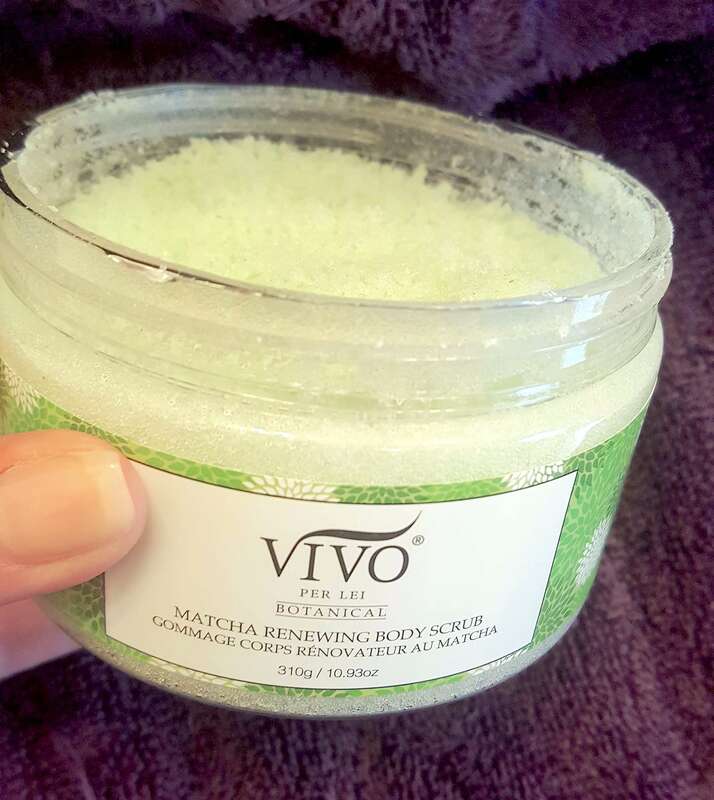 Product Description: Vivo Botanical Matcha Renewing Body Scrub offers a refreshing and purifying spa-like treatment for your whole body. Its botanical-based formula is brimming with purifying, anti-aging ingredients. Matcha Green Tea extract and Sea Salt work to smooth the surface of your skin while restoring a look and feel of resilience and suppleness that is silky-soft to the touch. Product Directions: Use 2-3 times per week while bathing. Smooth liberally onto clean, wet skin, massaging in deep, circular motions until salt is completely dissolved. Rinse clean with water. 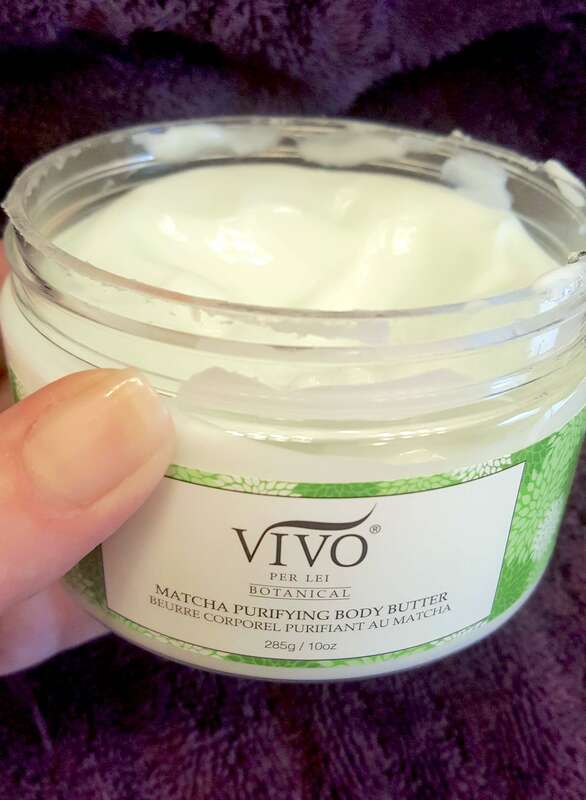 For optimal results, follow with Vivo Botanical Matcha Purifying Body Butter. Product Review: Oh my goodness, it was lovely! I am really not a fan of the scrubs that are salt or sugar particles suspended in oil. To me they leave my skin too oily and I have a hard time getting my body wash to lather afterwards. Likewise, the particles are usually too big for me to feel like they are truly effective. This one was fabulous! There was no oily residue and my skin felt soft and smooth. The grains were large enough to be felt but small enough to be effective. Let me just say, I am very picky about my body scrubs. I have been known to throw out products after one use because of the way they make my skin feel or even just the scent. Oh and the scent! It was fresh and green and soft, but left no real lingering smell. I was fine with that, since it did not interfere with my perfume. 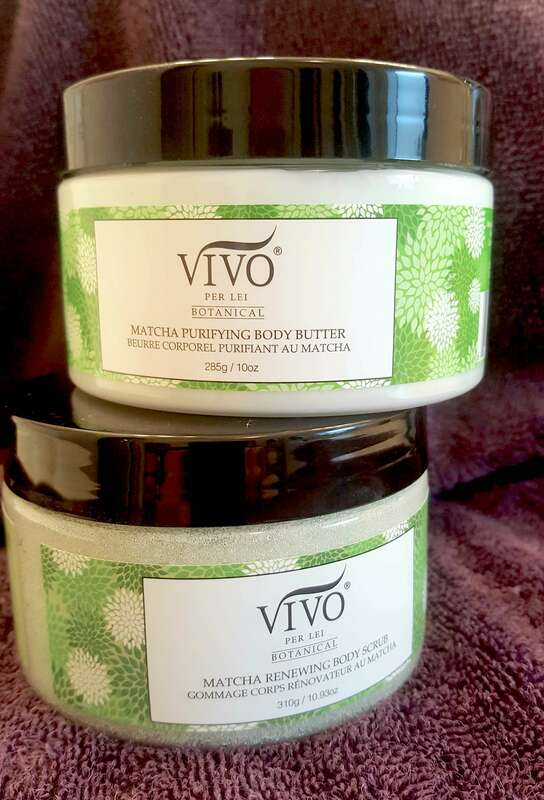 Product Description: Give your dry skin comforting care with Vivo Botanical Matcha Purifying Body Butter. This sumptuous blend of moisturizers features a lusciously rich consistency that will soothe flaky or parched skin. Infusions of Matcha Green Tea and other botanical extracts provide your skin with the utmost of assistance in restoring a softer and more supple look and feel from head to toe. Product Directions: Use daily on freshly cleansed skin, massaging liberally over your body until fully absorbed. For optimal results, use in conjunction with Vivo Botanical Matcha Renewing Body Scrub. Product Review: Most body butters can be so thick they are nearly impossible to apply and massage in. This one was completely the opposite. It sunk right into my skin and left it soft all day long. It was especially lovely after shaving; I could hardly believe how soft my skin was. Used in combination with the body scrub prior to shaving and the butter after I got out of the shower, just unbelievable! The scent was the same as the body scrub which is a nice layering technique, but it still was not overwhelming after it absorbed. I even used the pair as a quick manicure before heading out for the evening – exfoliating my hands and then lathering on the butter. Overall I was very impressed with the results, and the price point is extremely reasonable for the huge jar. Vivo Per Lei has quite an extensive line including both facial and body care. The Vivo Laboratories collection includes collagen products, retinol treatments, Vitamin C treatments, and specialty products such as the 60-second makeover and several facial masks. The Vivo Botanical collection offers several facial masks, body scrubs and body butters. The Vivo Dead Sea collection includes a number of body care and facial care treats. It’s a large collection that seems to have something for everyone – cleansers, serums and treatments, masks and exfoliators, and specialty products. Some of the facial care products that look particularly unique and effective are the Retinol Wrinkle Solution Thermal Mask and the Botanical Matcha Refining Facial Peel but do keep in mind I have a particular fondness for masks and scrubs. I think I just like the ‘instant’ results of these types of products. Don’t get me wrong, there are obviously advantages to the longer-term results of serums and treatments. But the right scrub instantly makes your skin softer, and more able to absorb whatever treatments you are putting on. Softness advantages! Your body has skin. I know, I know, I am not trying to be funny. But your body is covered in skin just like your face, and dead skin cells can accumulate there as well, especially on tougher areas like your knees and elbows. And when all of those dead skin cells build up, it can cause flakiness, crepiness, clogged pores, and breakouts. Not all of these can be solved with exfoliating alone but it can go a long way to help. Shaving advantages! You will be amazed when you discover how smooth your shave will end up when you exfoliate beforehand. Your razor will not get clogged with those dead skin cells, and it will just glide right over your skin. A smoother shave also means less nicks and cuts, when the razor glides instead of skipping over the rough areas. It can even reduce ingrown hairs if you are prone to them. Self-tanner advantages! If you’ve ever tried at-home self-tanner and ended up with streaks or uneven color, you definitely need an exfoliator beforehand. When you remove the buildup of dead skin cells and impurities, the self-tanner goes on so much more smoothly, with noticeably fewer streaks and blotches. Moisturizer advantages! This is the same theory as with exfoliating your face. Without the buildup of dead skin cells, your treatments and moisturizers will absorb into the skin where they can actually do their job. Just make sure you wear your sunscreen after exfoliating; you do not want to inflict new damage on that freshly revealed skin. It’s hard to believe but it really is that time of year. Time for swimsuits and tanned skin. But we all know that we really really should not expose our skin to the harmful UVA and UVB rays from the sun or from a tanning bed. Especially after we have so lovingly exfoliated our skin so nice and smooth. But that does not mean that we have to be pale through the summer season. That’s where self-tanner comes in! The products have come a long way since the orange phase of the 80s. The gradual ones are amazing, like you really did just get some natural color in that sunshine that we have to avoid. Exfoliate! I know, we already covered this one but it is critical for smooth self-tanner application. You can use a number of methods, depending on your preferences and skin type. A washcloth works just fine, as does dry brushing or a luxurious body scrub. Dry your skin thoroughly. Damp skin has a tendency to absorb the product unevenly and you won’t realize the blotchiness until it’s too late. Don’t try to apply it all over all at once; work in sections. Gentle circular motions help ensure a more even application for every area. I also highly recommend using a tinted self-tanner so that you can see where you have applied the product. Makes for much fewer surprises! Wash your hands after each section. Nothing gives away a new self-tan like orange palms. If you prefer, wearing gloves is a very reasonable alternative. Dilute the self-tanner with lotion on your drier areas such as elbows and knees and ankles. The drier areas have a tendency to absorb the color more readily and you will end up with those areas being darker. Let your skin dry thoroughly before getting dressed; typically ten minutes is reasonable. If you can, try to wear loose clothing and avoid sweating for about three hours to let the color fully develop. If the color develops darker in some areas, you can gently exfoliate that area to help even it out. “Gently” is the key – you do not want to exfoliate too much otherwise you will end up with the opposite issue. Instead of darker areas you could end up with lighter areas and then it is a vicious cycle to even everything back out again. As a product pair, I was extremely impressed with the Vivo Per Lei Botanical Matcha Renewing Body Scrub and Purifying Body Butter. It made me realize that I have possibly been neglecting the skin on my body. Ever since I was young, I was aware of the advantages of taking care of my skin all over, from my face to my heels. I am mostly a minimalist when it comes to clothing and shoes and furniture, and even kitchen gadgets. But I always have a collection of facial care and body care products ready at my fingertips. I like having options based on how my skin is feeling that day, drier or oilier or just plain persnickety. Likewise, I take pleasure and relaxation from my evening routine. My morning routine tends to be more hurried as I try to get out the door to work, but the evening is for me to take care of me. It is a nice twenty-minute time frame that removes the stress and dirt of the day, and prepares me for sleep. I rarely have issues falling asleep and I think that it due partly to my regimen, like my body knows it is time to get ready to sleep. After having the chance to try these two products from Vivo Per Lei, I am very interested in exploring this line further, including both the other body products and the skincare. Based on how my body’s skin felt, I can only imagine what this brand has to offer for my face. This entry was posted in Reviews and tagged body care, body skin, product review, skincare, Vivo Per Lei. Women’s Hat Styles – Which Will You Choose? Would love to find this. Is it in NY? The easiest way to purchase this is by visiting the Vivo Per Lei online store. Happy holidays! They look like great products!I would love to try these out sometime! These products sound so good and refreshing. Big fan of scrubs then using a body butter as soon as I step out of the shower. This sounds great! I love using body scrubs and I’d like to try this one. I love body scrubs and this body butter looks like it would be great for my dry skin. I love body scrubs and butters. These sound like they would do my body some good this winter. Thank you for the review. The scrubs look lovely and I would love to try. I want to use that right now! It looks like great! This looks like a product that would be good for my dry skin. does it leave your skin oily? Looks amazing! Love to try this product. Sounds very nice and refreshing! These sound great. Green tea is a very effective ingredient. Being kinder to all the parts of your body! thanks for the awesome information and the reminder! Thanks for the informative review ! I was just talking with a friend about matcha & all the amazing benefits it has. How perfect that I stumble across this post! Matcha, matcha, woMAN! Wow! Thx for sharing this great article about some beauty products that seem to be health food for your face. I would definitely like to try these beauties! The skincare dollars spent is terrible. I would like to try these. Would love to try these! They look so amazing and luxurious! These products sound so good. I don’t want scrubs that are in oil I think they make my shower floor slick. If I get one with oil I just close it up and give it to one of my nieces. Wow! I would love to try this scrub! I never knew all the reasons to exfoliate! This sounds lush and something I need to try. I live in Canada where are winters are harsh and hard on the skin would love to try this. I would love to try this this body scrub and body butter. I am a huge fan of the Vivo clay masks! So great for oily skin. Love body scrubs. This looks like something I’ll have to try. Thanks for the review. I’d love to try these products and review then in my social media pages! I got the big 30 last year, and have noticed some changes in my skin over the past few years. I’m a mother of 3, so it goes hand in hand! Stress, and tiredness sometimes shows through my skin! I’ve tried a variety of products, Lancome, Olay, Ponds, Neutrogena, etc. Still haven’t found “the one yet” that works best for me, although I do love to them all! Interesting, maybe this is needed for my skin since it is very dry. Recently I read an article that made me think differently about using scrubs and exfoliating the body. Prior to then I did it maybe once or twice a year, practically none. And it has helped so much. Thanks for reiterating this point and for the great tips in self tanning. These products sound amazing. I lobe body butter and scrubs.